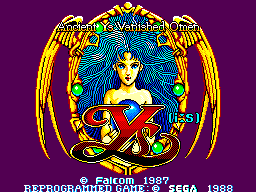 Ys: Ancient Ys Vanished Omen is a 1987 RPG developed by Falcom first released on the PC-88 before being ported to pretty much every platform released at the time and over the next few years. Its first port released overseas was to the Sega Master System by Sega in 1988; in the US and Europe it was sold under the name Ys: The Vanished Omens and in Japan simply as Ys (イース) (the game itself is still called Ys: Ancient Ys Vanished Omen). It is one of the few Master System games with FM support to have the FM code completely removed in its overseas releases. Furthermore, the game takes advantage of a VDP mirroring bug that was fixed on Master System 2s and anything based on that hardware (including the Sega Mega Drive); consequently the game will look incorrectly on these systems. It was later included on Falcom Classics for the Sega Saturn. Main article: Ys: Ancient Ys Vanished Omen/Magazine articles. NEC Retro has more information related to Ys: Ancient Ys Vanished Omen.